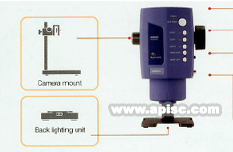 The Inf-500 microscope is a powerful high quality imaging tool for inspection and presentation applications.This unit is compact,convenient and versatile to use and delivers sharp well lit images to all types of video image display,printing and storage device and computers with USB2.0 ports. High luminosity LED lighting is arranged in two concentric rings.The inner and outer rings have 3 arrays evenly spaced at 120 degrees and the rings are offset 60 degrees to each other. Equipped with both video (analog) and USB2.0 (digital) outputs it would be difficult to find a situation where the Iin-500 can not be used to share vivid close up images. Convenient software is suppllied for viewing and storage of images when a computer is used. Optional accessories includes a mounting stand and backlighting unit.